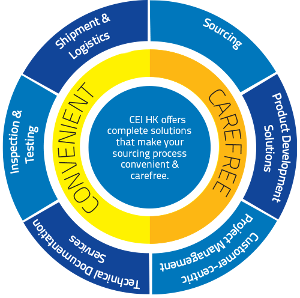 At CEI HK we value relationships, build trust between suppliers and clients. We turn relationships into partnerships, partnerships build on trust for a sustainable growth strategy. Best business practices are our organizations foundation providing a healthy business environment and work culture. We invite you to become a part of our family. Let us help you transform your initial concept into a retail-ready product. Our international team of competent engineers with an extensive track record in end-to-end sourcing, development, production and quality control can assist you every step of the way. Sources will come from carefully selected manufacturers that eventually became partners who share our work ethics and values in meeting our client’s needs in a timely and quality manner. Moreover, our pool of specialists can make certain that your electronic products will meet the safety standard and requirement of your destination market. We can also create a tool kit of visual equities like manual, packaging and photos that can easily be transferred into every form of consumer communication. Product flow will be managed closely so your shipment will reach its destination smoothly and efficiently. You will be taken cared for by CEI HK. We will be the bridge between the suppliers and you throughout the process so you will be consistently connected and reliably supported. We source from a range of carefully selected, qualified suppliers, suppliers who have a long term relationship with us, suppliers who turned into partners, understanding our work ethics and the importance of our clients requirements. Whether it is system or procedure in factory sourcing, product testing or on-site quality control inspections, we can make certain your electronic products meet the safety standards and requirements of your destination market. Our Freight Team will fully-manage every little detail of your shipping experience. We help you manage the product flow smoothly and efficiently so you can be confident your goods will reach its destination with minimum fuss and hassle. Our team is equipped with the know-how to get the product according to your requirement or need ready for the market. We help you create a tool kit of visual equities (manual, packaging & photo) that you can easily transfer to every form of consumer communication. Let us help you transform your initial concept into a retail-ready product with our experienced, international team of qualified engineers with an extensive track record in end-to-end sourcing, product development, manufacturing and quality control. Our experienced sales team accompanies you throughout the entire process. We form the bridge between you and the manufacturer so you’re constantly connected and reliably supported. We continue to connect throughout the process at key gates so you’re as engaged as you want to be. Let us find it or create it for you!